Kearney, NE - The Tri-City Storm defeated the Waterloo Black Hawks 5-2 at the Viaero Center on Saturday night behind goals from Michael Colella, Brendan Furry, Connor McMenamin, Brendan Budy, and Filip Forsmark. Isaiah Saville stopped a career high 42 shots in goal for Tri-City. In the win, Tri-City recorded its 25th victory of the season and clinched the regular season series against Waterloo. The Storm improved to 25-6-1-1 and increased its lead as the 1st place team in the USHL league standings. Tri-City travels to Ralston, NE tomorrow to complete a three-game weekend in a road matchup against the Omaha Lancers. Puck drop tomorrow is set for 4:05pm. Waterloo jumped out to an early lead less than three minutes into the goal on a goal from Joey Cassetti. The goal was his 11th of the season and gave the Black Hawks its first and only lead of the weekend. Tri-City netted the game tying goal twenty seconds later on Michael Colella's 5th goal of the season. Colella's goal was scored at 4:06 of the 1st period and was assisted by Khristian Acosta and Storm Captain Ronnie Attard. Tri-City buried another goal minutes later to give the Storm a 2-1 lead. The Storm's 2nd goal of the night was scored by Brendan Furry and was assisted by Brendan Budy and Ronnie Attard. Later in the 1st period, Storm Captain Connor McMenamin recorded his 10th goal of the season to give Tri-City a 3-1 lead. McMenamin's goal was scored at 16:54 of the 1st period and was assisted by Brendan Furry and Brendan Budy. Tri-City carried a two-goal lead into the 1st intermission break. No goals were scored in the 2nd period, and Waterloo scored just over a minute into the 3rd period to cut the Storm lead in half. Joey Cassetti scored his 2nd goal of the game and 12th goal of the season at 1:01 of the period to bring the Black Hawks back within one goal of the Storm advantage. The scoring play would be the final of the night for Waterloo as Tri-City netted back to back goals in the period. A power play goal at 9:33 increased the Storm lead to 4-2. The goal was scored by Brendan Budy and was assisted by Brendan Furry and Zac Jones. The goal was the 1st of Budy's USHL career with Tri-City. The game's final goal was scored by Filip Forsmark at 16:23 of the 3rd period. Forsmark's goal was assisted by Brendan Budy and Brendan Furry. Isaiah Saville made 42 saves on 44 shots to improve to 16-2-1-1 on the season in net. Tri-City returns to action tomorrow in a road game against the Omaha Lancers. Puck drop is scheduled for 4:05pm, with the broadcast beginning on Hockey TV and Storm Radio at 3:45pm. 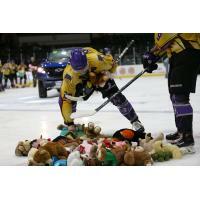 For home game tickets and more information on the Tri-City Storm, visit www.stormhockey.com.